The Orchid management had earlier disclosed in a conference call with analysts that revenues for the current year would rise between 15% and 20%, on the assumption that the generic approval for Zosyn would be received. If the approval hadn’t come, sales for the year would be flat. Zosyn, an intravenous antibiotic, is a combination drug consisting of piperacillin and tazobactam, and is the largest selling in its segment, according to Wyeth. In calendar 2008, Zosyn’s global sales grew by 11% to $1.26 billion or Rs6,100 crore while sales in the US market grew 22% to $701 million (Rs3,381 crore). In 2009, US sales have grown by 15% but international sales are down, as it faces generic competition in many countries. Orchid has said it will launch the drug through its marketing and distribution partner Apotex Inc. Depending on how soon it launches the drug, by how much the price falls and the market share it grabs, Orchid’s sales and profits will get a boost in the next few quarters. 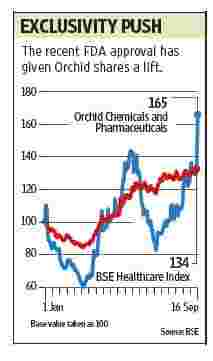 After the six-month period gets over, more generics firms will enter the market, taking share from these two companies, and the drug’s price will also fall. The market expects a windfall for Orchid, with the stock price up 25.6% to Rs159 on the National Stock Exchange on Wednesday. The company had not done well in the June quarter due to higher interest and depreciation costs and forex-related losses, which led to a loss of Rs27.7 crore.